There’s not a lot of Gamay in New Zealand, but it seems to have some promise here. The most well known example is the soild Te Mata Gamay, but there are two excellent examples from Central Otago, too (Mount Edward and Rippon). This is the latest one I’ve come across, made by Rod Easthope (formerly of Craggy Range) from Hawkes’ Bay fruit. 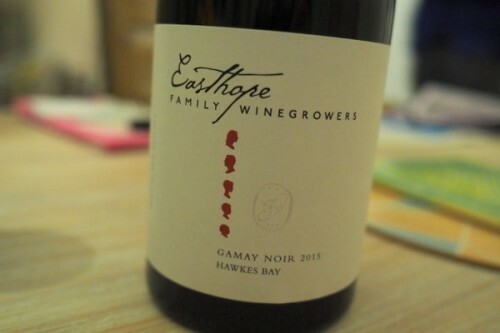 It’s made under his own label ( https://www.easthope.co.nz ) with his winemaker wife Emma. The grapes come from and old block planted in Hawke’s Bay over 15 years ago that had been forgotten about, and was just being blended into a larger planting of Malbec. So Rod managed to get his hands on these rows of Gamay, and the result is this wine. I was given it to try by Ian Quinn, a neighbour of Rod’s, who is a grower with 10 hectares that will soon come into production. This vineyard, named Two Terraces, consists of Chardonnay, Chenin Blanc, Gamay Noir and a bit of Syrah. Ian is currently debating whether or not to plant more Gamay. I urged him to go for it!